Creating an entire, unique setting from whole cloth can be enjoyable, and also yields a setting which is guaranteed to be at least somewhat surprising, due to lack of familiarity. Doing such is also a lot of work, however, and does have several downsides. Namely, players either needing to absorb significant setting information before sitting down to play (at the very least, everything relevant to character creation) or players being radically unaware of setting elements (which can be fun, but can also feel somewhat contrived; sometimes it’s reasonable for PCs to know something about the world around them). 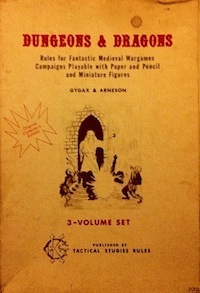 Using an existing setting can moderate some of these issues, but comes with its own set of problems, such as referee research requirements (you have to actually read and absorb the thing), reward of player setting mastery outside of engagement with actual play, and potential misunderstandings regarding accepted canon. It seems to me like there is space for an approach between the two extremes. Rather than writing encyclopaedic gazetteers or creating raw tables that must be entirely experienced though their effects on play, instead consider a list of slightly more detailed setting elements that are not yet fully integrated into a comprehensive setting. A full example of this is beyond the scope of this post, but one might think of Middle Earth being expressed as something like: Shire, Mordor, Mirkwood, Saruman, Moria, Rivendell, etc. Each of these elements is a landmark, something that everyone involved can use to become oriented. How these elements fit together in your particular instantiation of Middle Earth (or whatever), both politically and geographically, would be unique, but players would have a bit more to go on than the standard home-brew setting, and with less work required on their part. Players could have access to a basic version of the list as well (hopefully not longer than a page or two) outlining the major features and obvious factions. That, plus some campaign seed event, would be enough to get started. This is somewhat like how the Final Fantasy franchise reuses common tropes in different games. Players go into these games looking for chocobos, Cid, airships, and so forth. Discovering the various elements is part of the fun. This is the approach that I plan on taking with the default setting of Gravity Sinister. There will be a number of landmarks presented, but exactly how they all fit together, and where they show up geographically, is expected to be unique to every campaign. This not exactly the same thing as an implied setting, as the list of core elements will be presented directly, and referee guidance provided for how to place the landmarks and generate relationships between them. Torchbearer takes a somewhat similar approach, by referring to archetypal fantasy locations without detailing them (TB directs the game master to create a starter map by placing locations such as elfland, dwarven halls, a religious bastion, a wizard’s tower, and so forth). I’m thinking about something similar, though not quite so generic. This method could also be used with existing RPG settings, as suggested by the Middle Earth example above. Scan through your favorite campaign book and come up with a list of 20 or so elements that make up what you consider to be the essence of the setting. Thus, your own personal Forgotten Realms could be distilled into a list such as: Shadowdale, Waterdeep, Evermeet, Calimport, Harpers, Red Wizards, Drow, the fall of Myth Drannor, and so forth. (I’m not really very knowledgeable about the Realms outside of the first few Drizzt trilogies and the Avatar novels, so forgive me if that seems like a poor starter list.) Keep the list somewhat limited so that preparation time is minimized. Just let your players know that you will be basing the setting on a (possibly randomized) custom jumble of those elements, and to expect new and surprising juxtapositions. The benefits of a shared aesthetic and shared world knowledge are maintained while the hazards of such are minimized. This entry was posted in Uncategorized and tagged JRPG Basic, technique on September 12, 2013 by Necropraxis. I think Qelong is a good example of how to get a lot of settings information out in a very short amount of space. I think there are maybe 10 locations outlined, tops, but they give you enough flavour to figure out what the rest of the world probably looks like. I guess the terrain descriptions and example encounters also do some heavy lifting. I haven’t done much more than glance at Qelong yet, because I’m still hoping to experience it as a player. Part of the aspect that I’m trying to emphasize here is different relationships between the elements on a campaign to campaign basis. That is, more of a toolbox than a set area, so that players might know some high level bits but not how everything fits together. Qelong might be a great presentation of a sandbox, but I think what I’m trying to get at here is a method for a referee to create a unique sandbox, but in a way that is not completely foreign to players. Maps I would expect to work closer to geomorphs, or randomly generated maps, if that makes sense. This is exactly the approach I’ve taken with Yoon-Suin. Five key regions which you develop to your own taste and through random generation, with ideas for what is in between. This is terribly interesting but I feel like I’m not properly understanding it. I imagine Brendan’s idea very similar to it, only being more specific. I plan to do at least one example, and maybe more, so that might help. Do you have any specific questions that I could try to address? I’m sure having an example to look at will clear everything up.